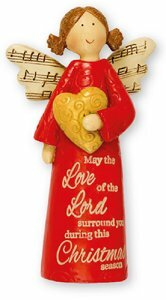 DIVINE CHRISTIAN GIFTS - Christmas Angel - Love of the Lord. Christmas Angel - Love of the Lord. "May the Love of the Lord surround during this Christmas Season." Christmas Angel Statue is 4 inch and made from resin.